If you have been won over by these lines in the tourism brochure, Srinagar should top your list of places to visit. If you are in Srinagar, you will hire a shikara (boat) to take in the beauty of the lake and the majestic mountains surrounding it. The road on your right, called the Boulevard -- Srinagar's most exciting address -- supplies you with booming bhangra-rock from Marutis and sirens from ugly-looking Maruti Gypsy-turned-armoured cars. There are rows of houseboats on your left. Your shikara man wants to take you to Nehru Park, a government-created island in the lake. Resist him. Turn left, go between H B Michael Jackson and H B Layla Majnu (H B for houseboat). Enter the 'Lake Colony', and you will witness the stuff tourism brochures are not made up of. The wide expanse of the Dal suddenly narrows into a dirty canal, flanked by a profusion of weeds and bushes. Even before the boat has proceeded 500 metres, you forget that the waterway is just a part of the once majestic Dal. From here begin the slums and ghettos that exist on the lake -- some 58 of them according to a 1986 survey conducted by the Urban Environment Engineering Department. At that time, the authorities had put the population figure at 50,000, mostly Shia Muslims. Rough estimates today, however, put the figure at around 100,000. Lanes and bylanes consisting of water. Boats for transport. Quaint houses of wood, some of them concrete. The resemblance to Venice ends here. 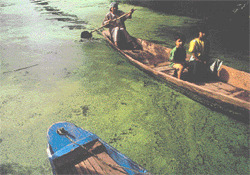 In the lake, the water is choked by weeds, called hill by the local populace, which also gives the water its dark green colour. 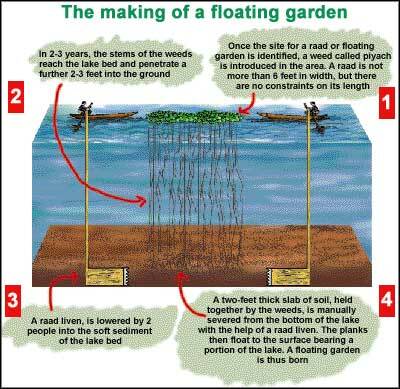 The weeds float to the surface of the water, making it difficult to row at times. However, not all is floating vegetation on the lake. Garbage, too, finds its way to the Dal. Among the debris floating on the water you can identify plastics, rotting vegetables and a variety of refuse. 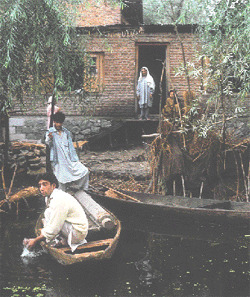 The land on either side of the canals is either used for cultivation or for houses and shops, many of which sell Kashmiri handicrafts. But the most prominently displayed billboard on this waterway is that of the Ali Ashgar Blood Bank. Another board is that of a doctor, presumably in great demand in the colony. As Nazir Ahmed, a resident of Moti Mohalla village on the lake, says: "My wife is suffering from jaundice because of the lake water." The government provides drinking water to the hamlets but, he says, a lot of people, especially women, suffer from a host of illnesses because their work (agriculture and housework) exposes them to the lake water. Most of the tourists who visit this part of the lake are foreigners, says Nazir Ahmed Kana, a guide and owner of Badami houseboat, which overlooks the Boulevard. When asked why foreigners are permitted a close-up of the seamier side of the Dal, "To show them how crazy we are," is Kana's instant response.